The tenth week of the Barclays Premier League season rolled on, as fans from around the country filled stadiums. 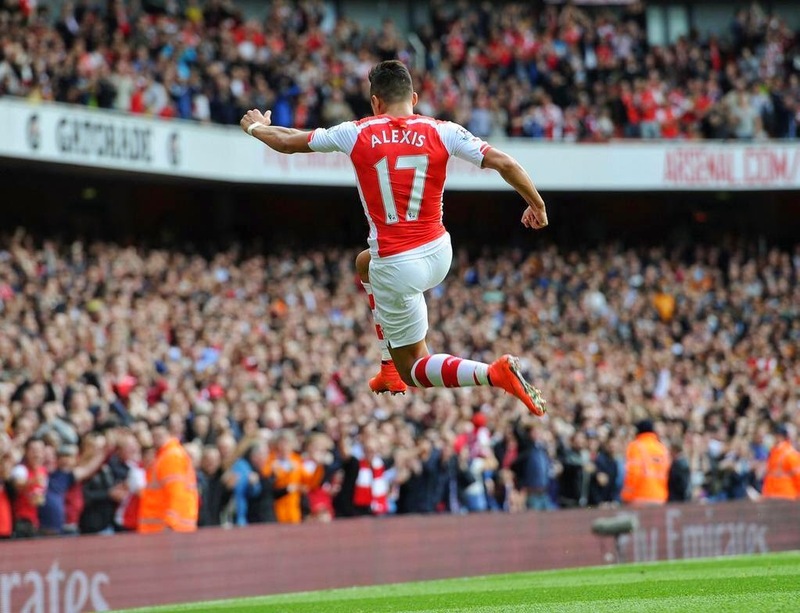 Chelsea's unbeaten run continued, while Sanchez came to the rescue for Arsenal, and more. At half time in the Premier League there was 3 goals in all of the 7 games. 9 goals where scored in the second half and at full time 14 points where handed out to 8 teams in today's games. Early on Winston Reid was forced to come off (Twisted Knee) and he was then replaced by Tomkins. Moses with the goal. A well struck volley from the Stoke man. Diouf scored for Stoke with a header from the right side of the box and the ball went into the middle of the goal. It was Valencia who pulled a goal back for West Ham. FT - The game was over and West Ham made the comeback to grab a draw. King Power Stadium Leicester, England. The ball got rolling again for second half and 2 minutes into the half Cambiasso scored an own goal. Leicester had a sitter but Andy King headed the ball straight at Foster. Konchesky hit the ball for goal but the ball went so far wide it was a throw in. FT - 1 goal split the sides with an own goal from Cambiasso. Boyd was booked early on for a miss timed tackle on Sanchez. Finally was the sound in the Emirates when Sanchez got ahead of two Burnley defenders and he headed the ball in from 6 yards out. Another corner was taken and it was Chambers who grabbed his first ever goal in his career. Podolski was Legit two yards out and hit the ball straight at the Burnley keeper and it went out. Sanchez got the ball outside the box and cracked the ball into the back of the net. FT - Sanchez got two goals and Chambers got his first ever senior career goal. A minutes silence took place at Stamford Bridge whilst all of the other games kicked off. Thirty two minutes had gone and Oscar found the net with a shot that went into the bottom left corner. Assisted by Cesc Fabregas. 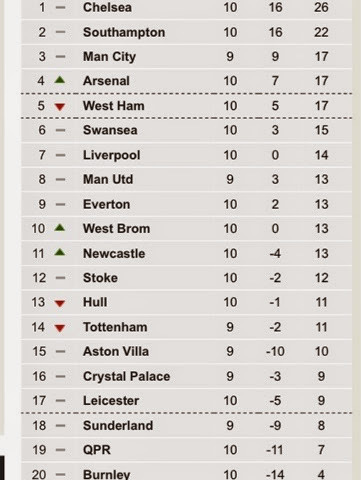 QPR went level vs. Chelsea. Charlie Austin with QPR's Goal. Hazard silenced QPR with a penalty when Vargas shockingly tackled Hazard. Vargas had a chance it came to Zamora and he hit the ball over. FT - Chelsea got a winner from a penalty when Vargas clumsily knocked Hazard down in the box. Shelvey got booked when Naismith was the one who made the challenge. Bony also got booked nearly straight after. Gareth Barry gets booked and in this first half we have seen more bookings than goals. 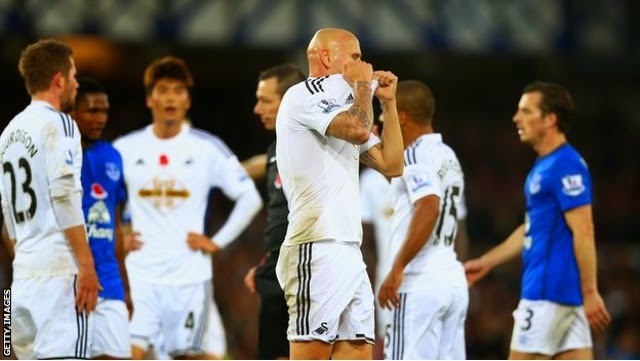 As we thought Shelvey finally got the red card he deserved. FT - Goalless and both sides have a point in the premier league. 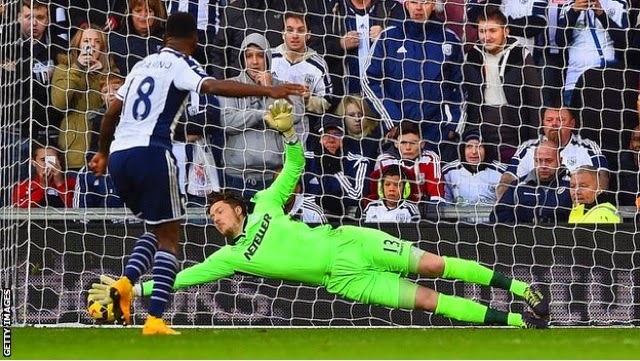 Wanyama scored early on and that is now 10 goals in 3 games for Southampton. Hull weren't even looking close to scoring, but just before the end Hull missed a sitter. 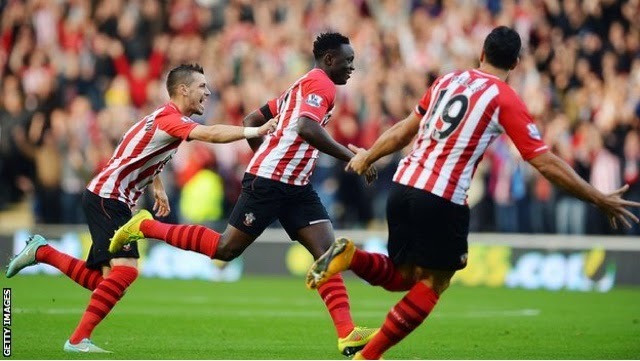 FT - Southampton have won 10 in 11 in the Barclays Premier League with their 1 - 0 win vs. Hull. Southampton go unbeaten in 3 games and Sanchez is Arsenal's best player of the season so far and Hazard sends Chelsea further In front at the top of the league. Three games are played tomorrow including Aston Villa, Sunderland, Tottenham, Crystal Palace and the big one Manchester United versus Manchester City in the BPL Manchester Derby. A recap from all the 3:00pm kickoffs from the Barclays Premier League Week 10 of the 2014/15 season, contested on Saturday 1st November 2014.